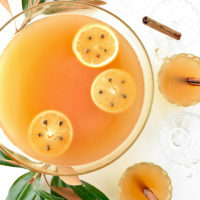 Warm up to a cup of this spiced up festive and easy homemade Wassail punch during your holiday celebrations. 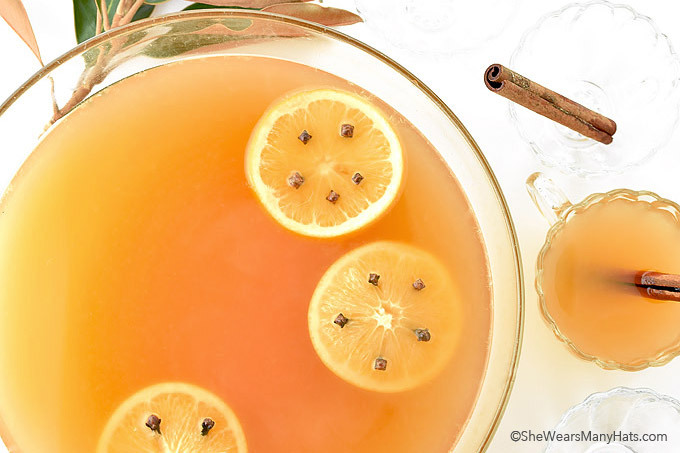 Wassail, or hot mulled cider is a delicious warm beverage perfect for all throughout the holiday season. 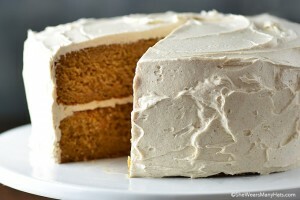 Make it for a fun holiday celebration or a cozy night in, either way nothing tastes (or smells!) more like everyone’s favorite season. Every time I think about warm and spicy Wassail, I start humming the cheerful Wassailing tune in my head, then it’s stuck in there for a while. It’s a happy tune so I’m not complaining. Are you familiar with the song? Here’s a youtube link if you’re not familiar with it. But be forewarned, you’ll be humming it for the rest of the day! This Wassail recipe comes from my mother and reminds me of home during the holidays. Not only is it delicious, warming you from your head to your toes, but it makes your home smell oh so wonderful! 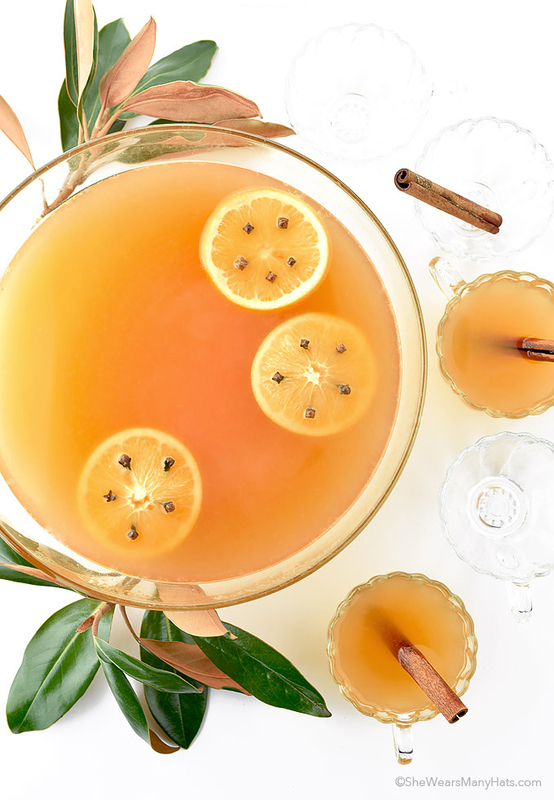 This spiced up festive and easy Wassail punch is perfect for your holiday celebrations. Insert cloves into two (2) of the oranges about 1/2-inch apart. Use a toothpick to make holes for cloves if needed. Slice the remaining orange; set aside. Warm cider in a stockpot. Add oranges and orange slices, cinnamon sticks, orange juice and lemon juice; bring to a simmer. Reduce heat to low; cover and cook for at least 30 minutes. 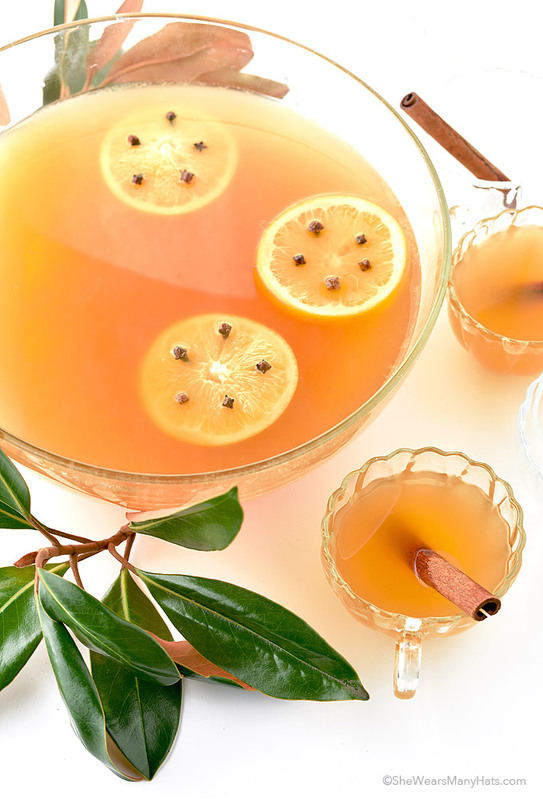 When ready to serve, carefully pour into heat-proof punch bowl; stir in vodka and brandy. Serve warm. Omit alcohol for a non-alcoholic version. Originally published November 12, 2105. This recipe sounds delicious (sans alcohol; it gives me heartburn)! I used to think I didn’t like wassail. Back in high school, a friend’s mother made it for a group of us during the holidays, saying the recipe was passed down to her from her Russian grandmother. It was terrible, but later we found out she had literally just microwaved orange Tang and sprinkled cinnamon on top! She insisted that’s how her grandma always made it. Yuck! I’ll have to try the real thing now that I have a recipe! Pingback: DIY: Wedding Coffee Bar (Wedding Fika) | lyrics, lace, & lagom. Festive and beautiful. Sounds delicious both ways! I have always wondered what wassail tastes like and was delighted to get this recipe. Can it be stored in the refrigerator and still keep its flavor? (There won’t be any alcohol in it.